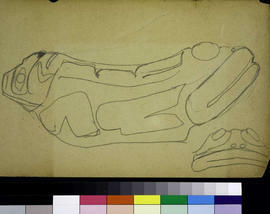 ItemPDP08870 - Early sketch of totemic figure. Title is for the sketchbook. Attributions and conjectures: The commercial name of this sketchbook is Blank Ontario Drawing Book No. 1. Published by W.J. Gage and Co. Ltd. Toronto. Statements of responsibility: The sketches in this book are all by Carr's hand. Source of title proper: Carr titled this sketchbook "Ottawa" , as she did sketchbook PDP08821. This item is among the materials that came via descent from Carr to Edna Parnall. 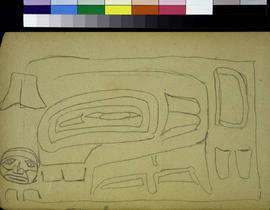 The Parnall collection consists of Emily Carr art and papers presented to the British Columbia Archives in 1989. One sketchbook comprising 26 sketches made while on a trip to Ottawa in 1927 when she met members of the Group of Seven. Drawings are of objects on display in the collection of the National Museum, particularly those with Northwest Coast aboriginal designs that Carr copied for reference. Carr's notes regarding colours and design aspects are also present on the drawing pages. This sketchbook was deacidified and disassembled in the 1980s because its physical condition was precarious. Each sheet of paper is encapsulated to prevent further damage. Because it is so friable, handling is restricted. Permission to view is required and staff must be the handlers. Received from Edna Parnall in 1989. This sketchbook PDP08868 includes PDP08869 through PDP08894. MS-2763 comprises the textual and published material from 89-081, the accession number of the donation from Edna Parnall.